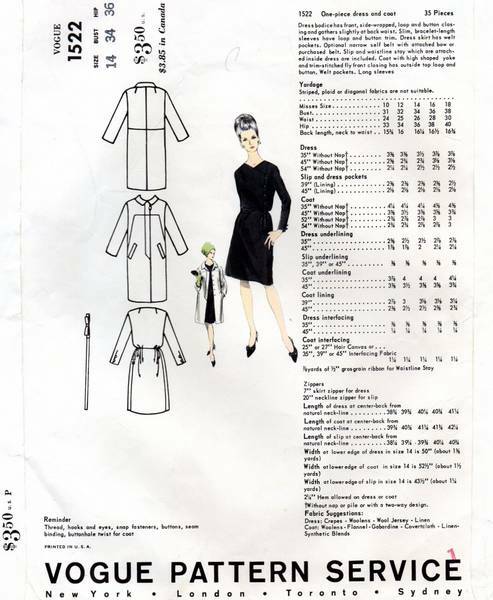 Vintage mid 60's Vogue Paris pattern designed by Christian Dior. Dress bodice has front, side-wrapped, loop and button closing and gathers slightly at back waist. Slim, bracelet-length sleeves have loop and button trim. Dress skirt has welt pockets. Optional narrow self belt with attached bow or purchased belt. Slip and waistline stay which are attached inside dress are included. Coat with high shaped yoke and trim-stitched fly front closing has outside top loop and button. Welt pockets. Long sleeves. Pattern is complete and partially cut.